Adviser to Mahmoud Abbas threatens 'unprecedented' response to Judea-Samaria building tenders. The Palestinian Authority has reacted to the announcement of 1,500 building tenders in Judea, Samaria and Jerusalem by demanding that Washington take "serious steps" against Israel Thursday. "It is time for the American administration to take serious steps against what the government of Israel is doing," Nimr Hammad, an adviser to president Mahmud Abbas, told AFP. Israeli Housing Minister Uri Ariel has invited bids for 1,500 new homes in Jewish settlements in response to the new PA government backed by Hamas, his office said earlier Thursday. 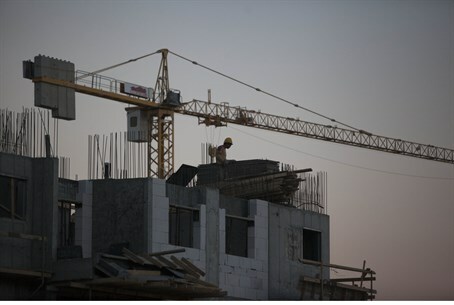 Of the new homes, 400 will be in Jerusalem's Ramat Shlomo neighborhood, with the rest elsewhere in Judea and Samaria - including 223 in Efrat, 484 in Beitar Ilit, 38 in Geva Binyamin (Adam), 76 in Ariel, 78 in Alfe Menashe, and 210 in Givat Zeev, the ministry said. "We strongly condemn this decision which affirms that Prime Minister Benjamin Netanyahu is a liar and is not interested in the two-state solution," Hammad said. Abbas spokesman Nabil Abu Rudeina warned the PA would "respond in an unprecedented way to this step," but did not elaborate. "These tenders come at the same time as the world announces is support for the Palestinian unity government. Israel should realize that its settlement policy is unacceptable," Abu Rudeina said. Abbas swore in a new merged administration for the West Bank and Gaza with the support of Israel's Islamist foe Hamas, which is committed to the destruction of the Jewish state and whose charter calls for a genocide against the Jewish people. Israel is boycotting what it calls a "terror government" but both the European Union and the United States have said they will work with it, drawing harsh criticism from Israel officials including Prime Minister Netanyahu, who branded the decision as "simply unacceptable".